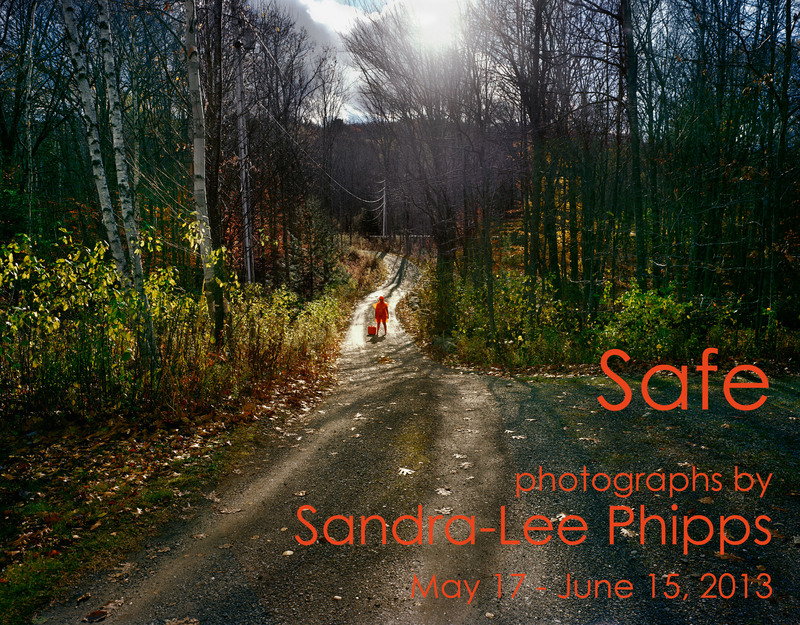 Please join us for the opening reception of Safe this Friday from 7 to 10 pm for the opening reception of Safe, photographs by Sandra-Lee Phipps at whitespace! The opening will also feature a one-night only, outdoor performance piece by Stephanie Pharr.For Safe, Sandra-Lee Phipps’ first exhibition at whitespace gallery and in Atlanta, Phipps presents two series of photographs that deal with the quest for safety in our cultural environment of fear. These works are set in the untamed forests and rural farmlands of Maine, a place of personal reflection and security for Phipps.Interweaving archetypal images with a symbolic color of power, protection and danger – orange, Phipps explores the fragile sense of self, self-preservation and her role as an artist within this expansive landscape. In the second set of works, two figures emerge and a tension is revealed between what is known and unknown in times of transition. 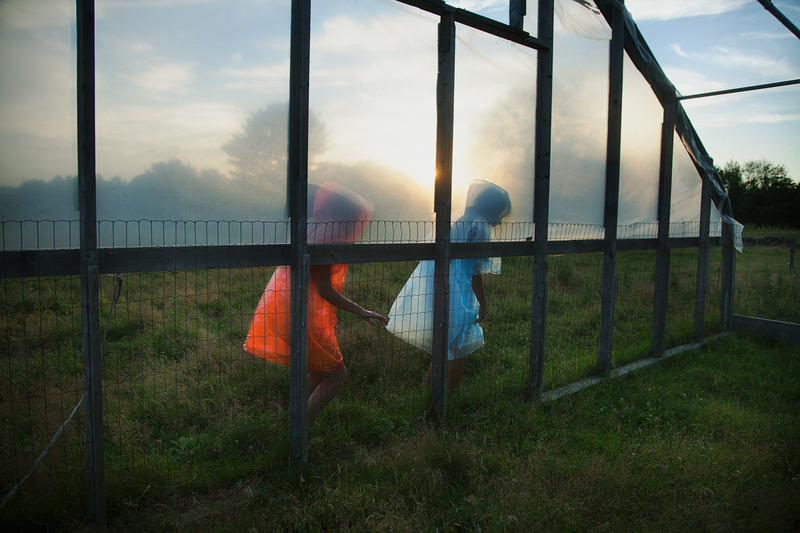 Though identical, the young girls wear colors signifying their difference, but also their bond – orange and blue. Wearing complementary colors, though visual opposites, the figures are intrinsically bound together. 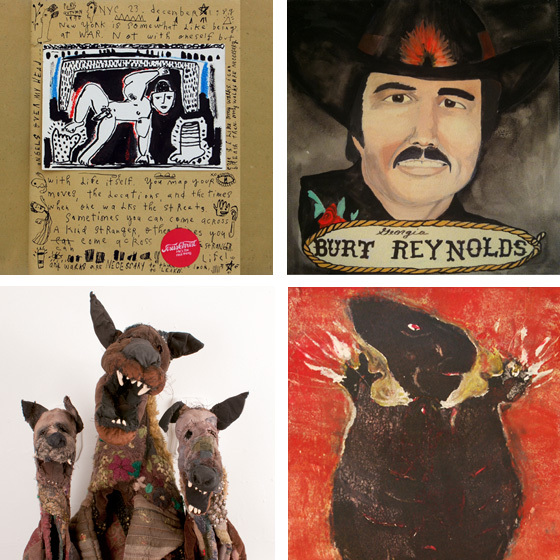 4 x 4 features the work of 4 artists and 4 compelling series. Though each artist is unique, their common visual threads are raw and bold, weaving the work together. Benjamin Jones, a notoriously reclusive artist, is ready to reveal the inner voices and thoughts behind his iconic drawings by opening the pages of his visual journals. HISTORY, Jones’ title for this series, includes journals from 1985 to the present, allowing viewers to handle and explore 15 of the intricate books for themselves. Each page is a deliberate composition designed to get every element just right before starting larger finished drawings. The pages become individual treasures in themselves, mixing poetic text and bold imagery. Lydia Walls’, powerful portraits honor 100 SOUTHERNERS who have shaped the culture in which she was raised. Walls always loved portraits but “didn’t have the confidence to paint people,” she says. After visiting Howard Finster’s Paradise Garden, his crude yet riveting portraits set her free. It’s important to Walls that the series of 6”x 6” paintings are accessible to everyone. Enjoy these delightful portraits, steeped in nostalgia, celebrating Johnny Cash, Martin Luther King, Rosa Parks, Mayor Ivan Allen, Helen Keller, B.B. King, Jimmy Carter, Margaret Mitchell, Little Richard, James Brown, two famous southern animals – Willie B the gorilla and Uga the dog – and many more. Linda Hall’s HOLLOW DOGS AND OTHER HOLY REMNANTS blends the feminine craft of quilt-making with the traditionally masculine sport of hunting. Handmade quilts collected from friends are sewn around life size taxidermy forms made of Styrofoam. Her other-worldly creatures are embellished with layers of paint and beads. According to Hall, once the shape is set, the form is removed leaving hollow “containers for the spirit.” Included are a full grown grizzly bear, raccoons, dogs, coyotes and deer, displayed in a tradition similar to 19th century trophy rooms. The artist seeks to re-ignite our universal connection to wilderness and a wild side in all of us that is in danger of being lost. Joseph Kurhajec is a world traveler who currently lives in Merida, Mexico, Paris and upstate New York. His collographs – relief printed from plates enhanced with paint, fur, reptile skins, human hair and cloth – are one-of-a-kind images. Deeply influenced by African fetishes and ritual objects from prehistoric cultures, his work seems to come from another place and time. SPIRITUAL MYSTERIES presents Kurhajec’s powerful and intriguing unique prints. Stop by whitespace this Saturday, April 20th at 2:00pm to hear Ann-Marie Manker talk about her latest body of work Under the Rainbow, on view through May 11th at whitespace. This exhibition focuses on the inner struggle of a femme fatale. Manker’s carefully rendered female subjects reveal the many sides of anima/animus through their actions. They play the role of oppressor, the victim or both. These women have remorse and delight for their actions, and they are simultaneously confident and insecure. The depicted females embrace violent aspects of their male inner selves, and in other moments, mourn the inevitable loss of their more feminine characteristics. 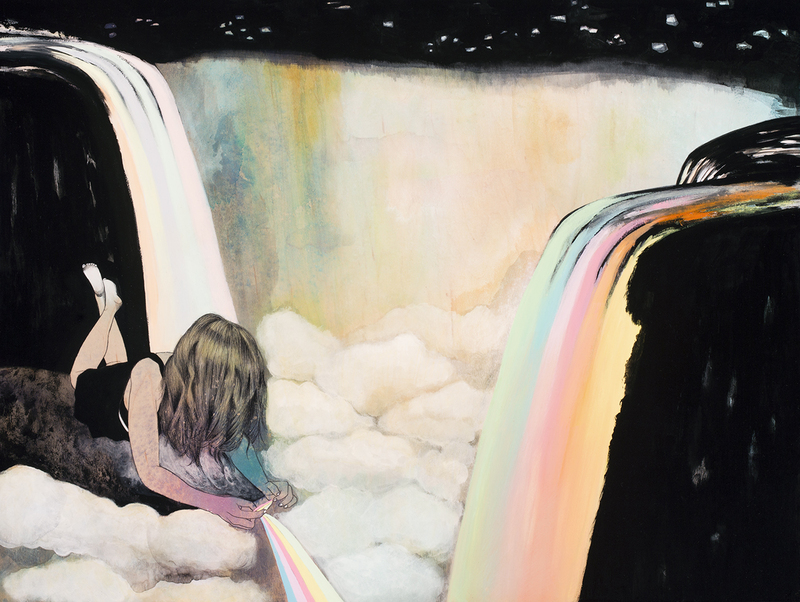 Setting the figures in psychologically charged landscapes filled with clouds and waterfalls, Manker uses various symbols in the work, predominately the rainbow. It is this product of light that empowers action, symbolizes control and feeds darkness that together characterize the femme fatales of Under the Rainbow. Under the Rainbow is Ann-Marie Manker’s third solo exhibition at whitespace gallery. For a full list of available works and pricing please click here. Ann-Marie Manker is an Atlanta-based artist and foundation studies professor at Savannah College of Art and Design Atlanta who has shown her work across the United States and internationally. Exhibitions of special note include Body of Work, Women to Watch 2010 Biennial Exhibition, at the National Museum of Women in the Arts in Washington D.C.; Young Movers & Shakers at the Museum of Contemporary Art of Georgia; Tiger Tiger Burning Bright at Roq la Rue Gallery in Seattle; Affinity, Vision and Difference: Women Artists from the Permanent Collection at Savannah College of Art Design Atlanta; Year of the Rabbit at Beep Beep Gallery in Atlanta and Savannah College of Art and Design Hong Kong; Pillow Talk at Ruth Bachofner Gallery in Los Angeles, CA; and Transatlantic at Gallery 24 in Berlin, Germany. Manker also received The Forward Arts Foundation’s Emerging Artist Award in 2006 and a Fulton County grant as a Hambidge Fellow in 2009. She holds a MFA in Drawing and Painting from Georgia State University and a BFA from the University of Southern California. 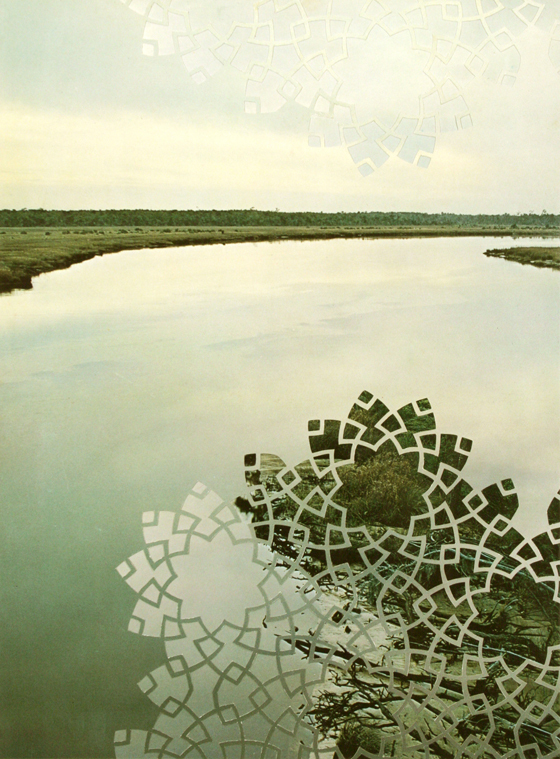 Dayna Thacker’s new body of work takes inspiration from the “thousand invisible cords” of modern string theory, ancient Islamic sacred geometry, and the all-pervasive principles of ecology. These complex areas of study have several overlapping concerns: the harmony of relationships; the correlation between the very large and infinitely small; symmetry; repetition; beauty; an appreciation for the elegance of a perfectly balanced system; and the extreme interconnectedness of everything. The unbalancing of our ecological system is leading inexorably to a terrifying future. In this work, Thacker seeks solace by exploring philosophies that expound the ideas of interconnection. These theories offer the reassurance of an all-encompassing structure within the universe that will persevere. The temporary event of our existence is put into perspective by the contemplation of the sacred and perpetual nature of reality. Dayna Thacker relocated to Atlanta in 2006 after receiving a Bachelor in Fine Arts from the University of Tennessee. She is a Studio Artist at the Atlanta Contemporary Art Center and a Hambidge Residency Fellow. She was a Fulton County Arts Council 2009 Residency Fellow and a Forward Arts Foundation 2010 Emerging Artist Award Finalist. This is Thacker’s second solo exhibition at Barbara Archer Gallery. The Young Architects Forum Atlanta [YAF Atlanta], a program of the Atlanta Chapter of the American Institute of Architects, is proud to present Joseph Choma, Assistant Professor at Southern Polytechnic State University, as this year’s awardee of the 2013 Emerging Voices Citation for his research and experimentation in architecture. 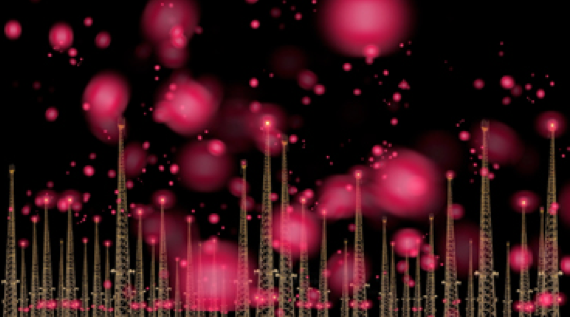 Barbara Archer Gallery will host the Emerging Voices 2013 exhibition, showcasing the work of Joseph Choma. EV13 will also feature a composition of the YAF Atlanta 48HRS Design Competition entries and winners – a competition that requires quick responses and fast, innovative thinking to a design problem within the city of Atlanta. 48HRS is intended to showcase the abilities of emerging designers and the value of good design to the greater public. Joseph Choma is a trained architect and designer, and founder of Design Topology Lab, a research platform dedicated to the ontology of space defined by mathematics. Joseph has been recognized in numerous design competitions and has been published in magazines and conferences internationally. His work has been exhibited in China, Columbia, England, India, Italy, and in the United States (CA, GA, MA, NV, NY, and PA). Amongst his exhibits includes a solo architecture exhibit at the MIT Museum as part of the 2010 Cambridge Science Festival, the 4th Architectural Biennial Beijing and the 9th International Beyond Media Festival in Florence. Currently, Joseph is an Assistant Professor at Southern Polytechnic State University. He is writing the first design guide to mathematical transformations to be published by Laurence King Publishing in February 2014. Choma completed his graduate studies in design and computation at Massachusetts Institute of Technology and holds a professional degree in architecture from Rensselaer Polytechnic Institute. Emerging Voices is an annual citation awarded to individuals and firms with a distinct ‘voice’ who demonstrate the potential to influence architecture and design within the Atlanta metropolitan area. Since 2001, the juried series has provided a public forum for the exhibition of early-career local architects and designers and encouraged the exchange of ideas among young practitioners and the public. The Young Architects Forum of Atlanta is committed to the continual education and community awareness of young architects and designers, by striving to bridge the gap between formal education and professional life. Membership in YAF is free and open to all young architects, interns and designers. We also encourage you to become a member of AIA Atlanta to take advantage of the full range of resources provided to the profession. Please visit the YAF Atlanta website for additional information. For the December Show, select whitespace artists are offering up new works on paper, providing the perfect holiday gift for the discerning art collector. This is a great opportunity to give the gift of art with affordable works on paper by Meg Aubrey, Laura Bell, Teresa Cole, Craig Dongoski, Sarah Emerson, Matt Gilbert, Wendy Given, Sally Heller, Kathleen Loe, Eric Mack, Ann-Marie Manker, David Yoakley Mitchell, Suellen Parker, Vesna Pavlovic, Malika Sqalli, Seana Reilly, Whitney Stansell, Richard Sexton, Ann Stewart, Richard Sudden, Tommy Taylor, Marcia Vaitsman, and Robert Walden. Whitespec brings together various emerging local artists for Decembrist Revival. Like the Decembrists who staged a revolt in Russia that led Czar Nicholas I to focus his attention inward to the needs of his empire, the work of these selected whitespec artists explore the idea of external action leading to a sense of self-awareness. An Imagined Decembrist’s Carol is an intriguing one-night only performance on Saturday, December 1 during the opening reception of A Moveable Feast. Each window of the main house will be transformed into a narrative vignette and visitors will be led around the property to witness performances and other surprises. You know you want to take a peek! The reception and exhibitions are free and open to the public. The walking carol will take place every half-hour between 8 pm and 10 pm. John Tindel is white. Michi Meko is black. Both are talented artists in their own right. 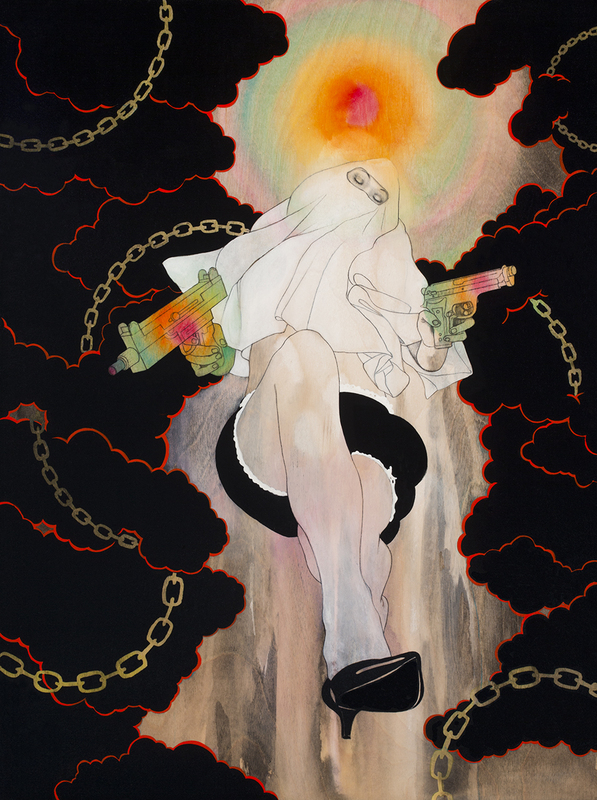 Together, they collaborate as TindelMichi, working on the same paintings and sculptures as one pair of hands seeking to redefine an urbanized, more racially sensitive South than their parents knew. 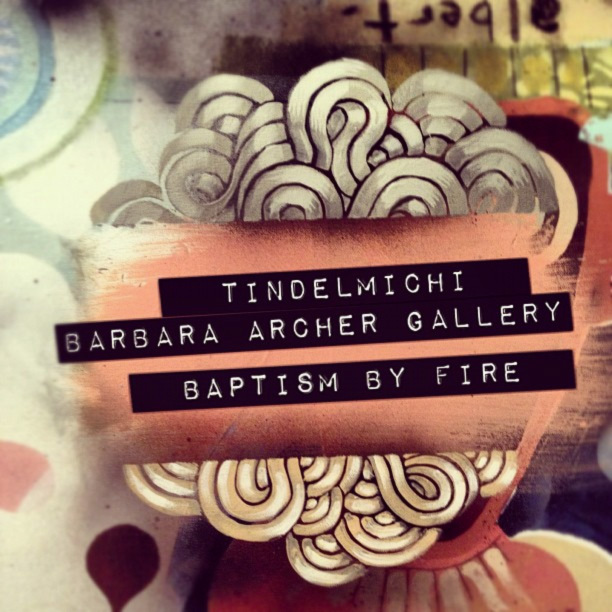 BAPTISM BY FIRE, featuring new paintings, sculpture and works on paper by the Atlanta pair, opens at Barbara Archer Gallery with a free reception on Friday, November 16 from 7:00 to 9:00 pm and runs through January 5, 2013. The work is full of humor and wit as suggested in the duo’s tagline: “Two fat Southern boys who paint.” Though both are formally trained artists, they aim to shake things up by merging their sensibilities to create unexpected celebrations of southern culture and tradition. Through their playfulness, they are “closely examining and questioning stories and things that harness the powers of racial division in this country,” according to a shared artist statement. Developing their own visual vocabulary based on rural culture, advertising, graffiti and other influences, TindelMichi’s vibrant work proves that two heads are better than one.